Lots of metal, lots of walking. 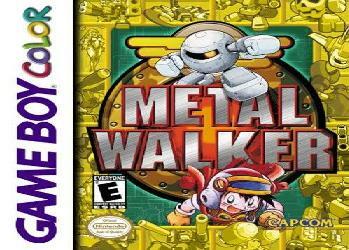 Metal Walker is an Action RPG developed for the Game Boy Color by Capcom. While the overworld is similar to most RPGs, the battle system is where the action comes in. Rather than selecting commands, you bounce your Walker around like a pinball to inflict damage. Depending on what form your partner takes, it can bounce for more damage and speed. Bouncing off walls is key to victory. Capsules are thrown into the battlefield, and may help or hurt you depending on what they do. At first Capsules are thrown in randomly, but later you can choose which ones appear. Not to be confused with Metal Gear Solid Peace Walker. After the End: The explosion turned the landscape into an unforgiving desert populated by killer robots. A.I. Is a Crapshoot: The evil HEX System can be stopped by the peaceful Eriko program. All There in the Manual: The manual gives more backstory on the setting, and your character's name, Tetto. Metal Walkers and Busters were originally created as mining robots. Apathetic Citizens: Averted; the citizens are more than happy to give you hints about things. They even point out which areas are where with directional arrows. In the very beginning of the game, one even saves your life. Armies Are Evil: In contrast to the peaceful Professor Eriko, Professor Xenon wanted to use Cores for military purposes. Cue explosion and a ruined landscape. Awesome but Impractical: Marine Cores have good attack and defense, but can only move well underwater. Coupling that with the fact that their weakness, Sky Cores, can move well on any field, you'll likely switch to something else as soon as you hit land. Baleful Polymorph: The Metamorit Capsule changes whoever hits it into an object. Big Bad: The HEX System itself. Brainwashed and Crazy: The Metal Masters, including your character's father. Combos: Destroy two or more enemies in a single move to be rewarded with bonus experience points. Continuing Is Painful: Dying cuts your money (Scrap Iron, in this case) in half. Critical Annoyance/Songs in the Key of Panic: Heard during battles when your HP falls below half. Also, the main boss theme IS this song. Cyber Cyclops: Most, if not all, of the Walkers and Busters are these. Damn You, Muscle Memory! : Outside the last dungeon and in said dungeon's boss battles, the walls are electrified and will hurt you. It's easy to forget this. Degraded Boss: B. Panther, the first boss, is fought as a regular enemy later, as does B. Eel, the second boss. And B. Dragon, who shows up as an encounter shortly after you defeat him. This is actually a viable combat strategy--most of the Busters are upgraded forms of each other. If you happen to have a Skullia capsule and use it on a B. Panther, for example, it downgrades him into B. Kong, a Mook. The downside is you don't get as many Experience Points for doing this. The Dev Team Thinks of Everything: If you talk to an old man, he asks if you miss your father. If you say No, he says "Sometimes it's better to travel alone." If you talk to him again and hit Yes, he'll say "You changed your answer. No one will trust you unless you're true to what you believe," and leave the house. He doesn't return. The same thing happens if you hit Yes, then No; for Yes, the old man says "You don't know the importance of parents until you lose them..."
Even selecting the same answer twice gets a different response. In Ever Green, if you talk to the shop owner before you talk to Dolfi, when you're done he'll remind you to talk to him. Difficulty Spike: The last two dungeons' enemies are stronger than anywhere else. This is Lampshaded by NPCs. Damsel in Distress: Emil Crowzer. And Marina. The Dragon: Tetsuo Kurama to Xenon, and Xenon to the HEX System. Drop the Hammer: Hammer Capsules. Dueling Games: With Robopon, though the two games are pretty dissimilar. Elemental Rock-Paper-Scissors: Land beats Marine beats Sky beats Land. Interestingly, this also applies to the battlefield; Marine Cores move much faster on water than land. Engrish: "Meta Ball's HP becomes to 30!" Evolutionary Levels: Your Metal Walker can assume different forms, each of which lets you progress further. The form accessed with the Marine Core, for example, lets you go across water. You can also level up the Cores by finding more of each type. 2 Marine Cores will let you go further in water. You can mix and match for different types of Walkers. Escape Rope: Some capsules, if used outside battle. Examples include Crane and the rather unfortunately named Get Blown. When used, they will return you to the last camp you entered. Exactly What It Says on the Tin: Many area names. Army's Area, Chemical Plant, and Muddy Lake are just a few. Feelies: A minor example, but like some Digimon games, a virtual pet device was released in Japan to help you raise your Walker. Different forms could access different areas and get items. FemBot: M. Venus, made by combining all three Core types. Foreshadowing: Very obvious foreshadowing. Unless you don't talk to NPCs. "I heard that the program Professor Eriko created was installed in a Metal Walker." "Professor Xenon and his colleagues were killed in a lab accident 50 years ago. But, some people say they've seen Professor Xenon..."
Goggles Do Nothing: Your character wears goggles for no real reason. Gotta Catch Em All: Not really, as you can't actually recruit other machines. What you do get is their Scan Data, which lets you use their weapons and unique Capsule data. Green Aesop: NPCs will tell you the land has become terribly polluted following the disaster 50 years ago; one area, Muddy Lake, is Exactly What It Says on the Tin. There is one area in the entire game with trees and grass, aptly named Ever Green. Guide Dang It: Figuring out where to go next can be quite a pain. To get to Radar Base A, there's a path that's easy to get to, but it's blocked by a rock that at this point you can't move. It's possible to wander around for a half-hour before realizing you have to go around the rock by jumping down from ledges a few screens below, then wander left and up. Some Capsules can be used outside of battle, even ones that don't heal you. In particular, Metamorit acts as a much-needed Repel, and Get Blown returns you to your Command Base. Finding the special Core Units. Pressing B when in battle lets you look at yourself, capsules, and enemies. Heel Face Turn: Professor Xenon. Heroic Bystander: The citizen who saves your character and Meta Ball in the beginning. Home Base: Your base camp is apparently portable or flying, as it crashes down in front of signs when you place it. Infinity Plus One Core: The special Marine and Land Cores are only accessible once you have all 3 Marine Cores. The special Sky Core needs all 3 Marine and 2 Sky Cores. Infinity+1 Element: Sky Cores, sort of. They can move well on any kind of field, have the highest bounce range, and their weakness, Marine Cores, only move well on water. It's Up to You: Expect this to happen when Emil or Badoh tags along. Keep Circulating the Tapes: It hasn't been rereleased or remade, and is very obscure. This makes finding it hard. Killer Robot: Metal Busters; they're even described as evil robots who hurt humans. Last Fertile Region: The Rusted Land is Exactly What It Says on the Tin, a polluted, rusting cesspool. However, there's one spot in the game with trees and plants, aptly named Ever Green. Lethal Joke Character: You probably wouldn't think to use Meta Ball much since he has no abilities. However, he can defeat the final boss pretty handily, especially if you level grinded. This is likely because Meta Ball is typeless; while he has no elemental strengths, he also has no weaknesses. Lonely Rich Kid: Emil. It's so bad her parents refuse to pay ransom when she's kidnapped. Luke, I Am Your Father: One of the highest-ranked Metal Masters is your missing father. MacGuffin: The Core Units, which power up your Walker. All the bad guys are after them. The Man Behind the Man: The HEX System to Professor Xenon. Master Computer: The HEX System. Meaningful Name: Ever Green is the one place in the game where grass and trees grow. Professor Green planted Ever Green's trees. Mega Manning: Analyzing Busters gets you their Scan Data, used to make the Capsules that they hold. Metroidvania: Returning to previous areas with more Cores can get you items. Mons: A subversion since you can't actually catch Busters. Your Walker can evolve, though. No Name Given: Your character. In the manual his name is "Tetto". This is never brought up in-game; on the name selection screen he doesn't even have a default name. No Ontological Inertia: When you defeat the HEX System and shut it down, all the Metal Busters stop working. Possibly Justified as they're machines. Not Quite Dead: Professor Xenon. Oh Crap: Everyone's reaction when Marina is kidnapped instead of Emil. One Game for the Price of Two: While only one version was made, the color of the communicator you select at the beginning determines which enemies you run into. To collect all the Scan Data you'll need a friend, or two copies of the game. One Hit KO: Being hit by harmful Capsules when you have less than the amount of HP they takes off. This can happen a lot in the beginning. Orcus on His Throne: The HEX Sytem uses Metal Masters to do its bidding. Justified since it's a supercomputer and can't exactly walk. Be my servant and conquer the world for me! Overshadowed by Awesome: Land Cores kind of get the short end of the stick. Since they're the first you level up fully, they're basically the weakest, and their weakness, Sky types, are plentiful. Parental Abandonment: Emil's parents are alive, but they've basically abandoned her. Player Headquarters: The various base camps. Some are in fixed locations, but most are free to place. You can only have one active at a time, however. Plucky Girl: Emil is somewhere between this and Spoiled Brat. She wants to find Core Units before you do, using super technology to do so, but freaks when she's in a dirty warehouse and leaves you to find it. Then she gets kidnapped. Polluted Wasteland: The Rusted Land. Posthumous Character: Professors Green and Eriko. The President's Daughter: Emil is the daughter of Mr. Crowzer, who is head of the company that makes Core Unit detectors. Quirky Miniboss Squad: The enemy Metal Masters, who are after the Core Units. Random Encounters: Quite possibly one of the highest encounter rates in any RPG. This is mainly why it's hard. What makes it worse is that the towns aren't safe. You can be attacked one step outside a building, and sometimes in the buildings. Also, in buildings and caves the encounter rate is increased. Randomly Drops: There's a chance after a battle to get an enemy's Capsule, even if you haven't scanned it. Ridiculously Cute Critter: Meta Ball. Save Game Limits: There's only one file. This is bad if the game erases your data. Save Scumming: Saving near buildings is a good tip since you can be attacked and potentially scrapped before you reach them. Also because you can't save IN buildings. Self-Imposed Challenge: Going through the game as Meta Ball wherever possible. Going through the game without scanning any enemies. Not recommended for the sane, as HP recovery items are only found in enemy capsules. Shifting Sand Land: Areas on the west side of the overworld are this, complete with desert cacti. Shout-Out: Meta Ball, your partner's first form, looks like a mix between a Sniper Joe and a Metool. Justified as both are made by Capcom. Sound Test: In the area where you get the special Land Core, there's a guy who has all the songs in the game, even ones you may not have heard yet. To reach him you need 2 Sky Cores, though. Spell My Name with an "S": Emil's name in the manual is Emiru, her Japanese name. Spoiled Brat: Emil hates unclean places and people, kicking Badoh out when he tries to save her. She's happy to help you, though. Too Dumb to Live: "I thought if I dropped this special Core Unit into the lake, it'd become clean again!" Unfortunate Names: The name of a capsule that returns you to base? Get Blown. The Very Definitely Final Dungeon: The tower in Neo City. Professor Hawk Lampshades this by outright saying it's the last dungeon, and advises you to save. Virtual Ghost: Professor Eriko, a scientist who died 50 years ago, seems to have a literal ghost in various computers. Turns out that Eriko is a computer program. The owners of said computers aren't very perturbed by this. In fact, they seem more curious than anything. "Wake-Up Call" Boss: B. Panther, the first boss, not only has decent health, strength, and speed, but he also has a wicked rebound--if he bounces off a wall, he'll crash into you for sure. The fight teaches players to strategize by bouncing at angles and use Capsules effectively; if you took him head-on you'd die pretty easily unless you grinded. We Can Rule Together: The HEX System makes this offer to the player after seeing how you beat Xenon. When It All Began: The Rusted Land is the way it is due to an accident 50 years ago. Where Are They Now? Epilogue: Emil is being her usual, spoiled self, taking a walk outside when her parents ignored her again. Badoh is hunting for Core Units and found one! Professors Hawk, Xenon, and Kurama are working to use Cores for peaceful purposes. And your character is working with Dolfi and Marina to make the Rusted Land a beautiful, green place again. You Have Outlived Your Usefulness: The HEX System says this to Xenon. Interestingly, it doesn't attempt to kill him. This page was last edited on 9 April 2017, at 19:51.